Fits Galaxie / Fairlane / Falcon / Maverick / Comet / Mustang / Cougar all with 5 × 4.5" bolt pattern. 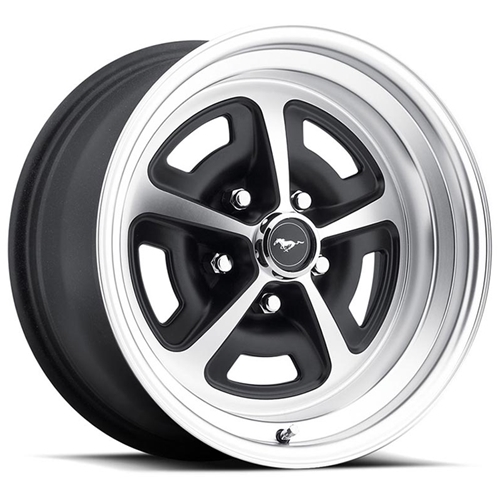 This is a 15" × 7" Legendary Magnum 500 aluminum alloy wheel. Machined finish rim with satin black inlays. The wheel has a 4.25" back spacing, and a 5 × 4.5" bolt pattern inches. Sold each. Center caps and lug nuts sold separately. NOTE: Will not fit 1966–67 Galaxie or 1966 Thunderbird with disc brakes. NOTE: There is a $15.00 per wheel shipping charge on this item for the continental U.S.